Property Location With a stay at Hotel Elysee in New York (Midtown East - Grand Central), you&apos;ll be minutes from Sony Wonder Technology Lab and Rockefeller Center. 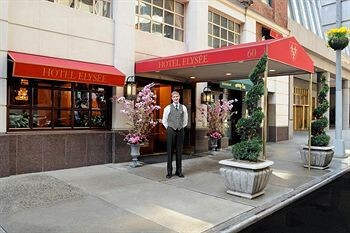 This 4-star hotel is close to Grand Central Terminal and Chrysler Building.Rooms Make yourself at home in one of the 100 air-conditioned rooms featuring refrigerators and flat-screen televisions. Wired and wireless Internet access is complimentary, while iPod docking stations and cable programming provide entertainment. Conveniences include safes and desks, and you can also request cribs/infant beds.Rec, Spa, Premium Amenities Make use of convenient amenities, which include concierge services and tour/ticket assistance.Dining Grab a bite to eat at the hotel&apos;s restaurant, which features a bar, or stay in and take advantage of room service (during limited hours). Meet other guests and eat at a complimentary reception. Quench your thirst with your favorite drink at a bar/lounge.Business, Other Amenities Featured amenities include dry cleaning/laundry services, a 24-hour front desk, and multilingual staff. Self parking (subject to charges) is available onsite.